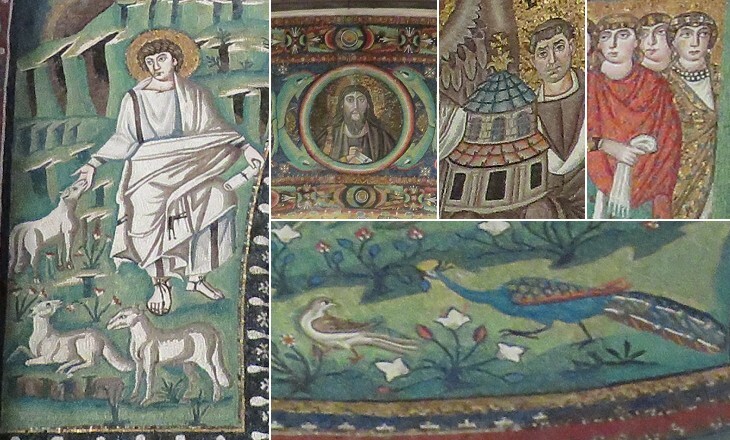 You may wish to read an introduction to this section and pages on Ostrogothic Ravenna and S. Apollinare in Classe first. 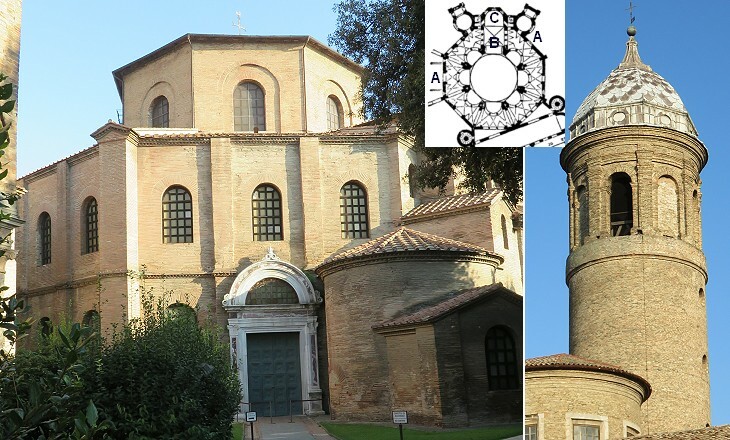 Under Byzantine rule architecture assumed a more decidedly Greek character, and the most remarkable building at this time in Ravenna was the domed church of S. Vitale. It was founded by Bishop Ecclesius who held the see from 524 to 534. In 525 he had been to Constantinople together with Pope John I on a mission from Theodoric, who sent these Catholic prelates to treat with the Emperor Justin for toleration of the Arians in his dominions. (..) S. Sophia was not begun till eight years after the visit of Ecclesius to the capital, but we know there were other domed edifices there. The domed church of SS. 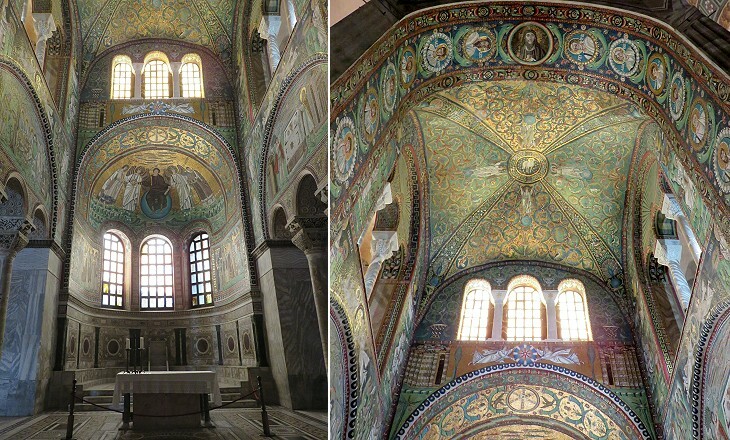 Sergius and Bacchus, which Procopius says Justinian built during the reign of his uncle Justin, must have been nearly completed, and the plan has so much in common with that of S. Vitale that it seems tolerably certain Ecclesius followed it to a great extent in his new church at Ravenna. In no other way can we account for the novelty of the plan, which breaks away entirely from the basilican form of preceding churches. The inscriptions state that at the command of the blessed Bishop Ecclesius, Julianus Argentarius (a rich banker) built, adorned, and dedicated it, and the Very Reverend Bishop Maximian consecrated it in 547. (..) Probably the building did not progress very far under the Gothic kings, who were Arians. 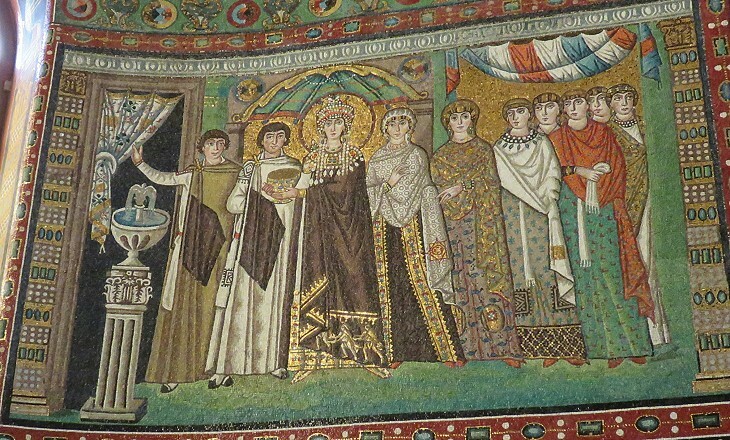 The completion at all events is due to Justinian and Theodora, who with their attendant courtiers appear in the mosaics of the chancel bringing bowls in their hands containing offerings for the pious work. (..) The construction seems to have required further support, for at some time flying buttresses have been constructed against two of the exterior angles of the octagon. An unusual aspect of the layout of S. Vitale is that from the two entrances one does not see where the main altar is located. 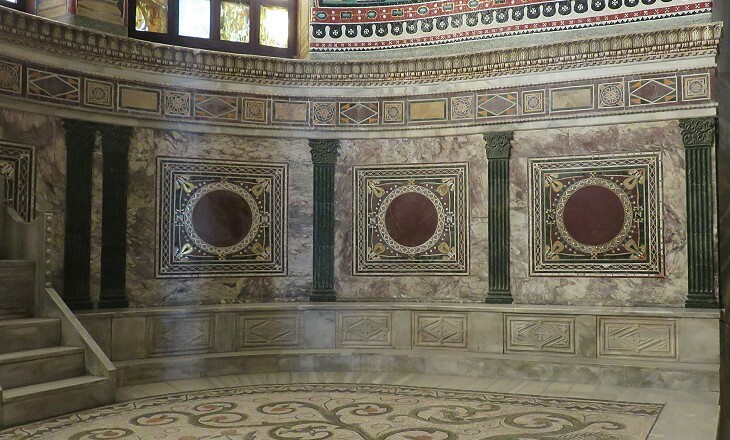 From two of the eight sectors into which the church is divided the faithful cannot see the main altar; from two other sections the main altar is visible, but the choir behind it is not. This may explain why very few Italian churches were built following the model of S. Vitale. 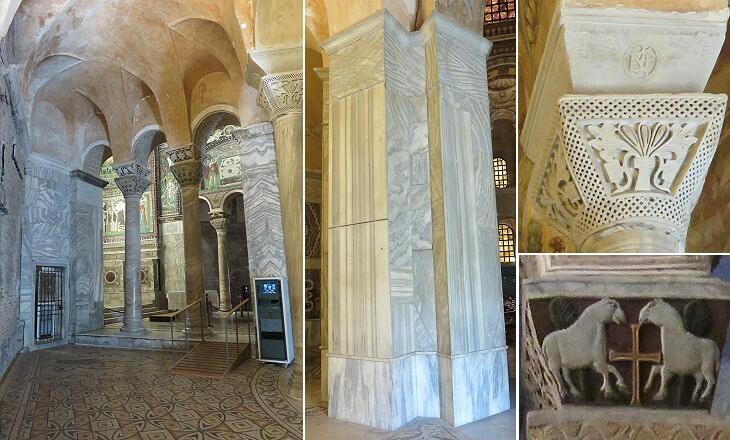 Its design is excellent instead for holding processions inside the church similar to an ancient perambulatorium at Pergamum. In 1899 the decoration of the walls was brought back to the aspect it had in the VIth century. 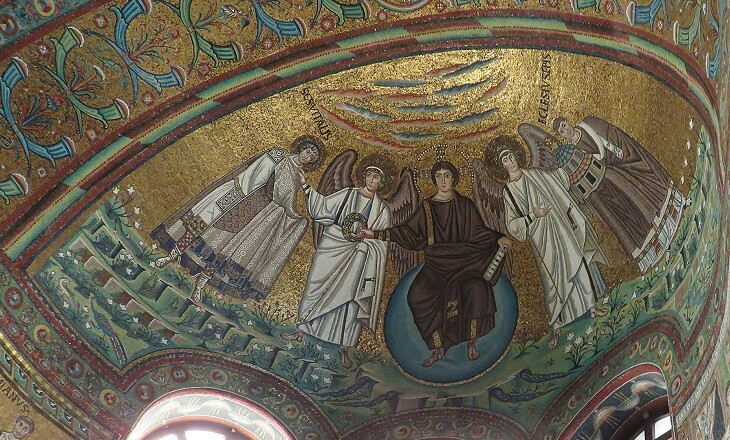 In the semi-dome of the apse a youthful figure of Christ seated on a cerulean globe, is portrayed between two angels and St. Vitale (left) and Bishop Ecclesius (right) who holds a model of the church. St. Vitalis was a Christian martyr who was tortured and then buried alive when his faith was discovered. A church was dedicated to him in Rome in the early IVth century. In 1601-03 this church was decorated with impressive frescoes showing his martyrdom. In 546 Justinian appointed Maximian, a native of Pola, as Bishop of Ravenna. 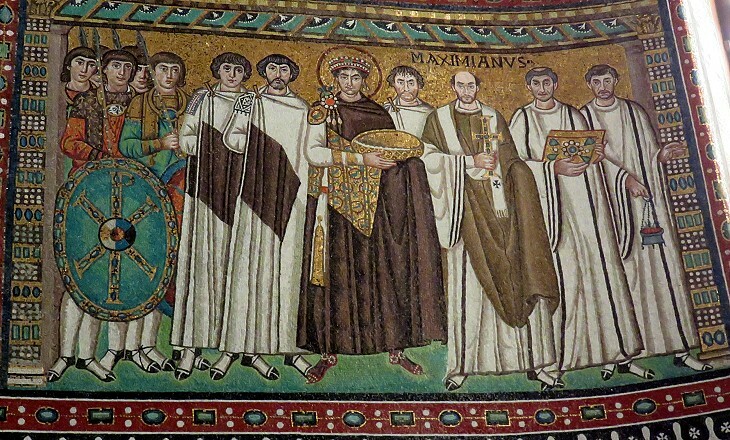 Justinian never visited Ravenna, but it is generally believed that the portrait at S. Vitale resembles the emperor, whom Maximian knew very well. Consistent with the Roman tradition the faces depicted in the mosaic were portraits and not iconic images. That at S. Vitale is the "official portrait" of Justinian because an equestrian statue of him at Costantinople was destroyed after the city was conquered by the Ottomans in 1453, his portraits on the coins he minted are very poor and other mosaics portraying him were most likely destroyed by the Iconoclasts in the VIIIth century. 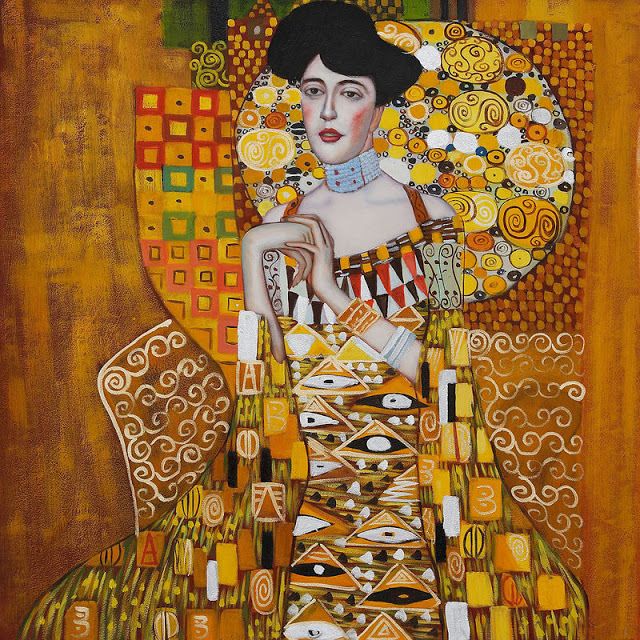 The faces generally lack expression and the bodies depth, but this has not prevented the mosaic from becoming the best known image of the splendour of the Byzantine court and from influencing the works of modern artists, such as Austrian painter Gustav Klimt who visited S. Vitale in 1903 (see his portrait of Adele Bloch-Bauer - it opens in another window). Both Justinian and Theodora were portrayed with a nimbus; they are considered saints by the Greek Orthodox Church. She died in 548, shortly after the consecration of the church. Justinian died many years later, in 565. He did not remarry. S. Vitale was built almost at the same time as S. Apollinare in Classe. 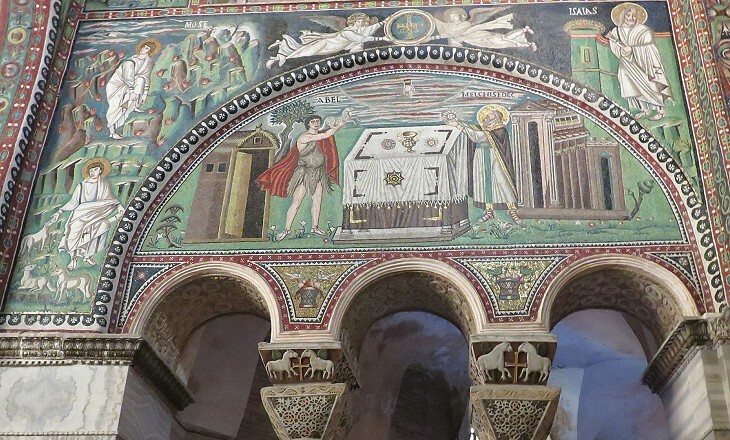 While the architectural design of the two churches is entirely different, some subjects such as sheep and the offers by Abel, Melchizedek and Abraham appear in the decoration of both churches. This mosaic and that on the opposite wall (see below) show a congestion of subjects. 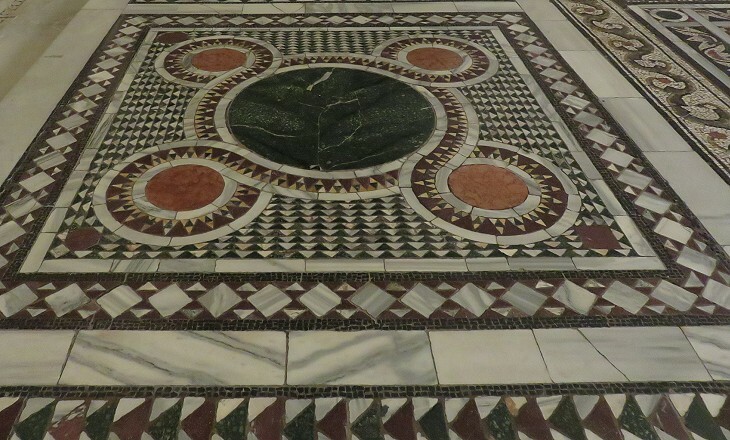 This because the maker of the mosaic had to deal with an unusual, not symmetric surface to cover, which he eventually divided into three major sections each having its own subject. 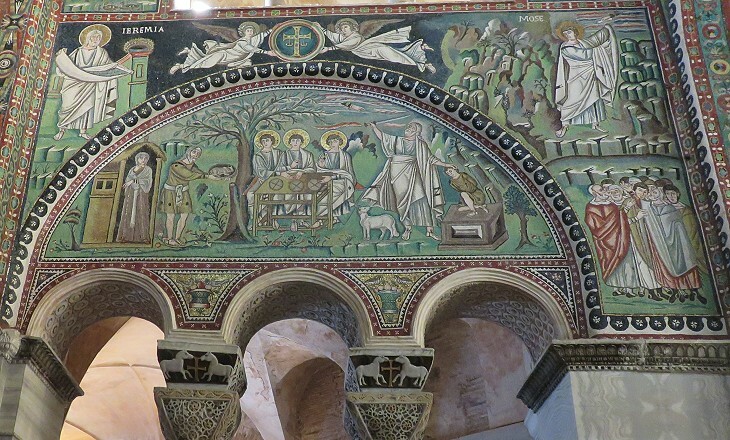 The didactic purpose of these mosaics is very clear and it seems a forerunner of the medieval and Renaissance frescoes which decorate so many Italian churches. Under the great dome sat an artist whom I envied, making at an effective angle a study of the choir and its broken lights, its decorated altar and its incrusted twinkling walls. The picture (..) won't tell the owner, unless he has been there, in just what a soundless, mouldering, out-of-the-way corner of old Italy it was painted. Henry James - Italian Hours - 1909 - piece written in 1873. Those who wish to relive James' experience ought to visit S. Vitale in the early morning before phalanxes of one-day tour visitors march off from their coaches into the church. When Bishop Maximian consecrated S. Vitale in 547, the war with the Ostrogoths was still going on, but most likely he was confident it would have soon ended with the victory of the Byzantines and Ravenna would have been the rich capital of Italy. But this rosy picture did not materialize. A plague which had begun in Constantinople spread to Italy where the Ostrogoths managed to resist until 553. The Byzantines had no resources to maintain a strong army in Italy and in 568 they were unable to oppose the Longobard invasion of most of the country. 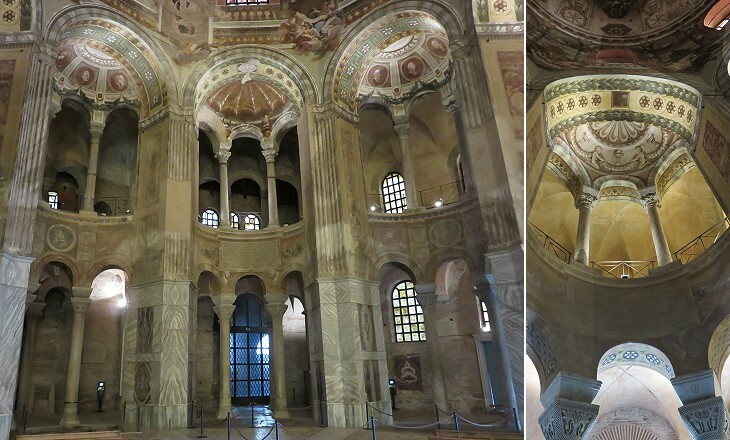 This explains why no other large churches were built at Ravenna during the Byzantine rule which lasted until 740. 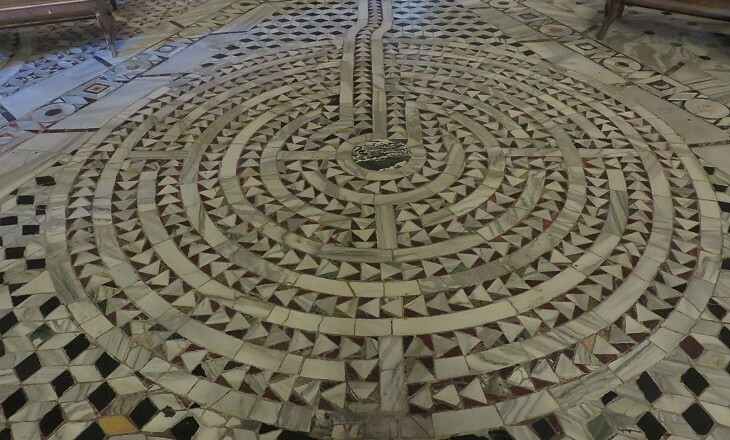 The ancient floor mosaics of S. Vitale resemble those at Monastero della Beligna in Aquileia and they were not made with the same care used for those in the choir. 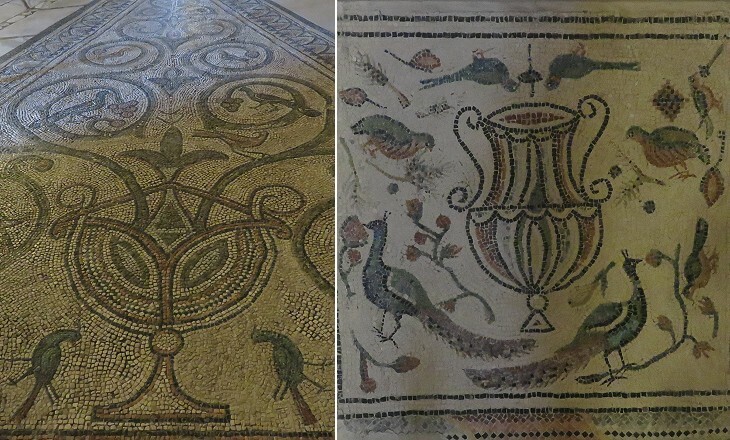 S. Vitale - floor mosaic in "opus Alexandrinum"
Although Ravenna declined after the VIIIth century, its main churches, unlike those at Classe, were never abandoned and they underwent repairs and modifications to adapt them to new circumstances and needs. 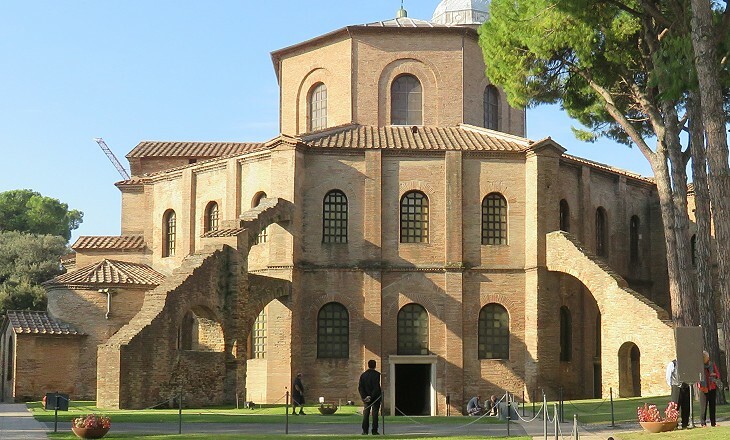 In the Xth century S. Vitale became part of a Benedictine monastery, which owned many estates outside Ravenna and was able to pay for a new floor. And rich inhabitants, with generous hearts. John Dryden (1631-1700) - Theodore and Honoria, an adaptation of the "Story of Nastagio degli Onesti" from Boccacio's Decameron.